Putra Sampoerna (born in Schiedam, the Netherlands, October 13, 1947, age 65 years) is an Indonesian businessman who is known as the third president of the tobacco company PT. HM Sampoerna. Son is the third generation of the family Sampoerna in Indonesia. He is the son of Liem Swie Ling (Aga Sampoerna) and grandson of Liem Seeng Tee, the founder of Sampoerna. Son first gained international education at the Diocesan Boys School, Hong Kong, and then at Carey Baptist Grammar School, Melbourne. He then continued higher education at the University of Houston, Texas, United States. Graduating from college, Son indirectly involved in the family business. Together with his wife, Katie, Americans of Chinese descent, the Son live in Singapore and run a company that manages oil palm plantation owned by Malaysian businessman. New in 1980, the son returned home to join in the operation PT. Sampoerna. The man who enjoyed a nine it started to become an important figure in the leadership of the company after receiving the highest as chief executive officer of his father, Aga Sampoerna, in 1986. Once Aga died in 1994, son of the more active to boost performance by recruiting foreign professionals to contribute to developing his business empire. Son is widely known as the captain of a company that is not only good in innovating the company's core products, namely cigarettes, but also keen to see the business opportunities in other business segments. In the cigarette business, the name of the Son can not be erased developing new market segments, namely low-tar and nicotine cigarettes. HM Sampoerna is a pioneer product in the country with a mild product, A Mild. During kepemimpinananya, PT. Sampoerna also expanding business into the supermarket sector and founded Alfa Bank acquired Sampoerna in the late 1980s, although it ultimately failed banking business. In 2000, son of the company's leadership turned to his son, Michael. March 2005 is an important period in the travel business and the Sampoerna family, where the son decided to sell the Sampoerna family sold all shares in PT HM Sampoerna Tbk (40%) to Philip Morris International. The announcement was a surprise acquisition of internal stakeholders (Employees HM Sampoerna) and external company (investors, economists, etc. ), in which the decision to sell the family business that has been initiated since 1913 assessed all walks of Sampoerna is a business move that is very high risk, given HM Sampoerna has been a major source of income even when the Sampoerna family sold the company's performance is very good. Performance HM Sampoerna was then (2004) managed to net income of Rp15 trillion, the production value of 41.2 billion cigarettes and third place tobacco companies dominate the market, which controlled 19.4% share of the cigarette market in Indonesia, after Gudang Garam and Djarum. Until now Sampoerna reason to sell is not clearly known. After the sale of PT HM Sampoerna, the Son and the family established Sampoerna Strategic as a new investment vehicle. Sampoerna Strategic engaged in telecommunications (Cheers), palm oil (Sampoerna Agro), timber (Samko Timber) and microfinance (SME Friend). Sampoerna Strategic dinahkodai by Michael Sampoerna, the youngest son. 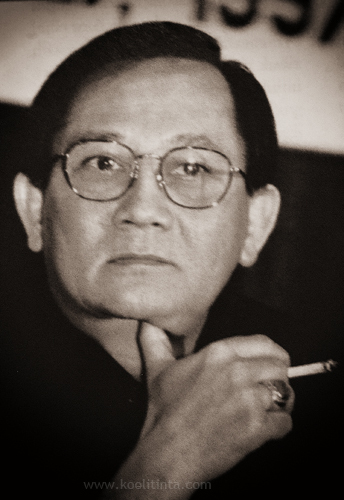 In 2001 he founded a social organization Sampoerna Foundation (PSF), led by his daughter Michelle Sampoerna. Through it seeks to advance the PSF Indonesia through four pillars: Education, Women's Empowerment, Entrepreneurship, and Humanitarian Assistance. In early 2006, it was reported that the Son, known fond of gambling, has become the owner of the giant gambling company based in Gibraltar, Mansion. At the same time, Mansion reportedly will replace Vodafone as a sponsor of football club Manchester United for four years in a contract worth £ 60 million, but the contract was later canceled. Then turning to sponsor Premier League football club Tottenham Hotspur other since the 2006-2007 season. In addition, also bought Sampoerna casino Les Ambassadeurs in London at a price of 120 million pounds.